Early last month we released a new broadcast AM high pass filter product. 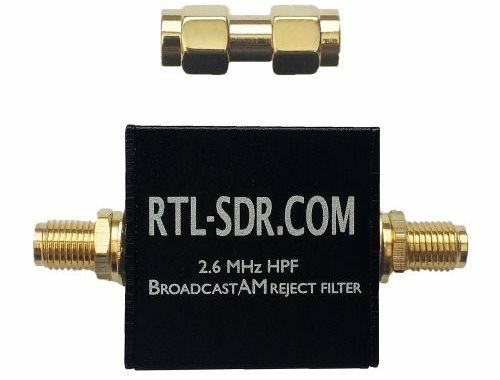 The goal of the filter is to block out extremely strong broadcast AM signals (and other problematic LF/MF signals) in order to prevent an SDR from overloading. This is especially needed if you live close to AM towers. Over on the Utility DX Forum files section, reviewer D. B. Gain has written an excellent review of our broadcast AM high pass filter (pdf), also explaining why and in what situations it might be needed. In the review he explains how broadcast AM propagation works, and how it can change from day to night. He also explains how devices with diode switches (used for switching RF circuits such as filter in and out electronically) can easily overload and contribute to IMD within the switches themselves. This is why a filter without any diode switches in front of it is usually the best solution for reducing strong RF energies. In the review he then goes on to test the filter, showing some screenshots of the reduction is AM signal strength. One of the most problematic strong signals you can encounter is regular 88 – 108 MHz broadcast FM stations. They transmit at high power and can cause overloading and intermodulation problems on simple receivers such as the RTL-SDR. This means that FM stations can prevent you from receiving signals even when you are tuned far away from the broadcast band. 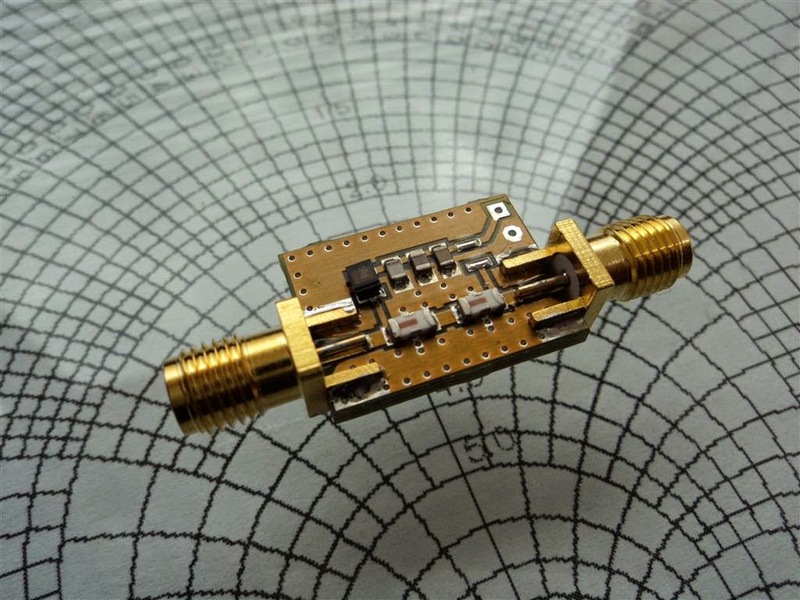 The simplest solution to reducing strong FM stations is to build an FM trap. This is simply a band stop filter that blocks frequencies between 88 – 108 MHz from entering your radio. 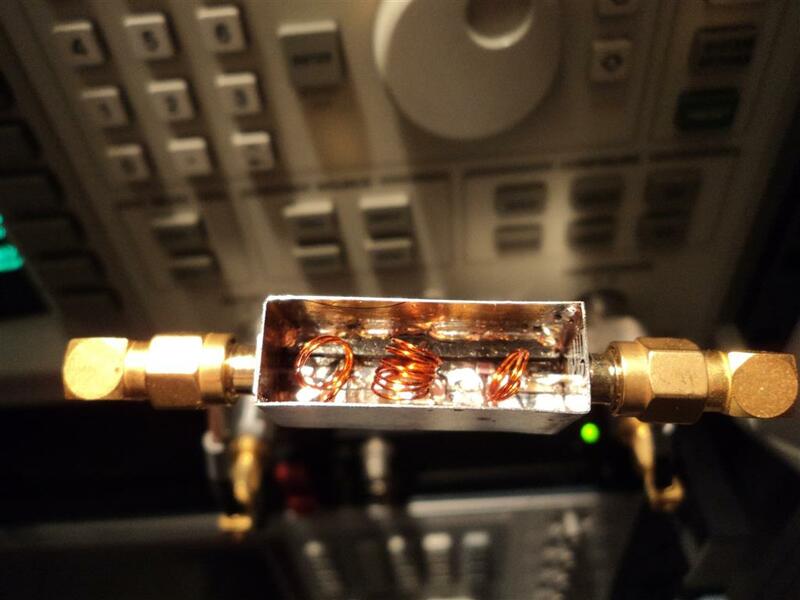 Adam (9A4QV), the creator of the popular LNA4ALL and several other RTL-SDR compatible products has recently uploaded an article showing how to build a home made FM trap out of cheap common parts. Adams article goes through and explains the design of a FM trap and how to use freeware software to aide in the calculations. The final FM trap designed by Adam uses just 3 common SMD capacitors and 3 hand wound coils. His filter attenuates more than 30dB in the 88-108 MHz range with an insertion loss of less than 1dB up to 1.7 GHz. Adam who is the manufacturer of the popular LNA4ALL low noise amplifier (LNA) that is commonly used with the RTL-SDR has come out with a new product for ADS-B enthusiasts. The product is an ADS-B filter with a built in bias tee for providing phantom power. Adam previously sold an older version of the ADS-B filter that came without the bias tee. The bias tee allows you to inject DC power into the coaxial cable in order to easily power an LNA (like the LNA4ALL) or other device that is placed near the antenna. The antenna could be far away from a power source, such as on your roof or up a mast. It ensures DC power reaches the LNA, but at the same time does not enter the RTL-SDR dongle, as DC current on the antenna input could destroy the RTL-SDR. For best performance it is recommended to use an LNA near the antenna, especially if you have a long run of coaxial cable between the antenna and RTL-SDR. The filter uses Low Temperature Co-fired Ceramics (LTCC) type components as opposed to the seemingly more commonly used SAW and microstrip filters. Adam writes that each type of filter has its tradeoffs, but he believes the LTCC filter is the best for this application. 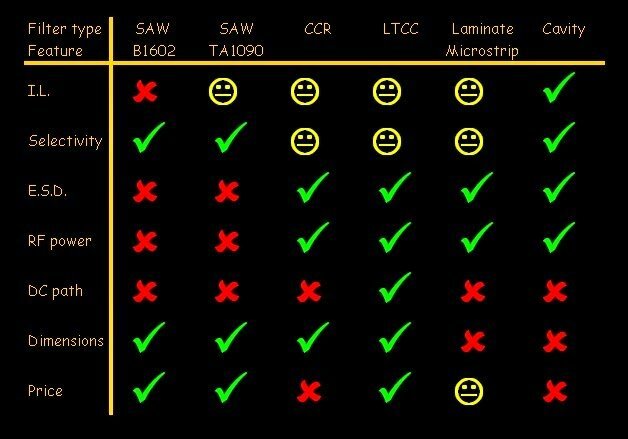 Comparison between different filter types. The insertion loss of the filter in the pass band is about 2.4 dB and the filter will significantly attenuate broadcast band FM, TV stations, WiFi and 1.8 GHz+ cell phones. However, it does not do so well with 950 MHz cell towers and possible radar on 1.2-1.3 GHz as the LTCC filter is not as sharp as a SAW filter. In Adams own tests he shows that the addition of the filter improves ADS-B decoding performance by about 20%, but the improvement you see will vary greatly with your RF environment. The filter is currently selling for 20 Euros + 5 Euros shipping (~$28 USD). Over on YouTube user Mile Kokotov has uploaded a video showing his home made low loss helical bandpass filter for 145 MHz, but also tunable from 110 MHz to 160 MHz. Bandpass filters are useful for the RTL-SDR as often strong out of band signals can cause overload, causing poor reception. A bandpass filter blocks all signals outside of its pass band. A helical bandpass filter is simply a coiled wire enclosed in a conductive container that can be tuned with a variable capacitor made out of two plates. In his video Mile shows the inner construction of his helical filter, explains the parts and shows what calculations he used for construction. Over on YouTube RTL-SDR experimenter Adam Alicajic has uploaded a video showing how it is possible to use the RTL-SDR as a tool to measure the frequency response of an RF filter. To do this he uses a noise source circuit which produces wide band white noise connected to an LNA4ALL, connected to the RF filter and finally connected to the RTL-SDR. Then using the Touchstone spectrum analyzer software he does a 300 MHz bandwidth sweep over a section of the spectrum which shows the response of the filter. The noise source can be built from a simple diode based circuit as shown in a previous post, or if you have the Ham-it-up upconverter you can buy the parts for the noise generator part of the circuit. In his video he shows the frequency response of a 145 MHz helix filter, a coax notch filter and a 1090 MHz home brew bandpass filter.